Read Day 1 if you haven’t already…. We woke up the next morning around 6 a.m. Dawn had already broke and the sky was getting light. Some of the other hikers had begun to rouse before 6, knowing it would take them longer to get ready and drink their coffee that morning. We were hoping to make maybe 12 miles that day in order to ease our mileage for the third and final day so we wouldn’t be leaving the forest so late for our four to five hour drive back to DFW. The ups and downs of the previous day were mostly over; the topo map showed mostly level ground with a few minor climbs later on in the day. 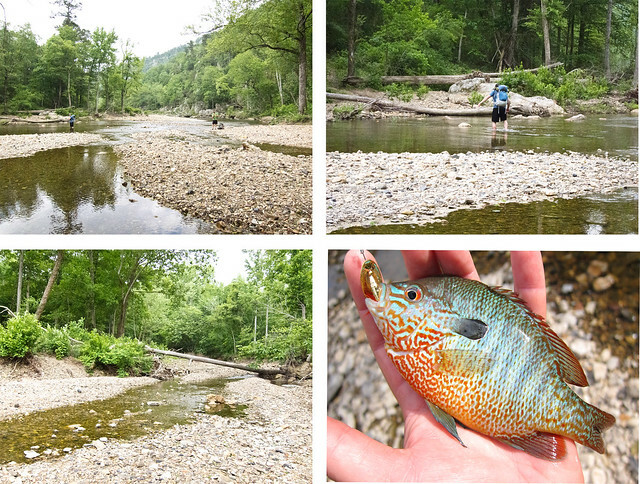 We would be following streams and later on the Little Missouri River, the rest of the trip. It was a beautiful morning, cruising along the trail, listening to the birds, stopping to look at the water. 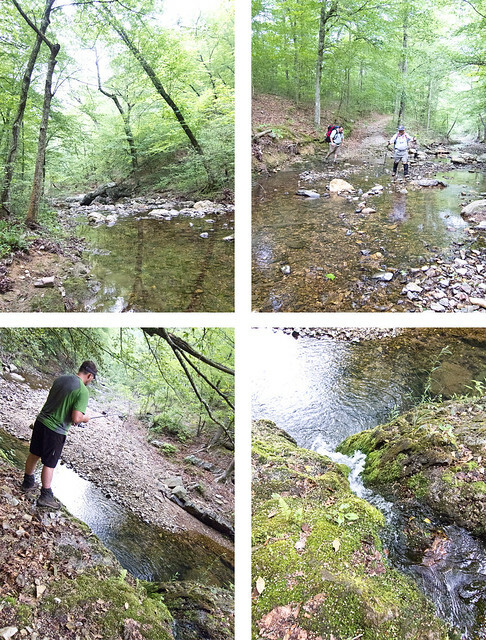 The trail bounced back and forth across the stream, forcing us to rock up as best as we could. 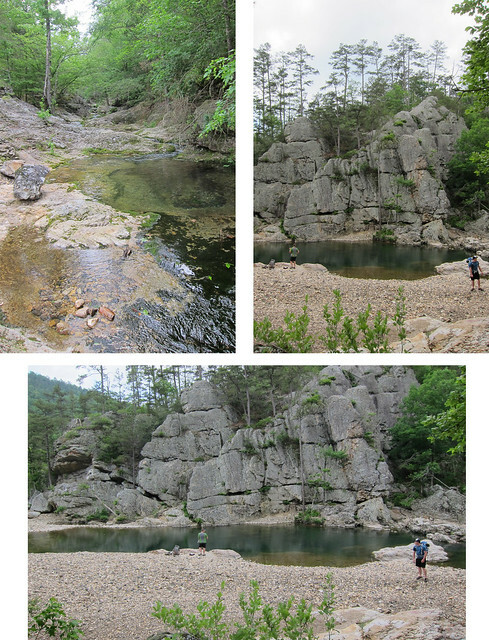 Chris found several deep pools to stop and fish at, allowing the group up front, the faster group, to wait for the others in the back. I liked this kind of hiking, though sometimes it was frustrating, but for the most part I enjoyed it because I could relish the sights and take it all in. I wasn’t drive-by hiking. Had it been warmer that morning this would have been a great place to stop and swim. A few times I found myself hiking alone, something I’m not really used to. Chris and my my brother tended to hike ahead so Chris could stop and fish, and while I tried to stay with my dad most of the time, sometimes I found myself alone all of a sudden. It wasn’t bad, just different. Somewhere around this area I started feeling like the 3.5 miles to the river should be getting close. Soon enough I sensed it even more as the terrain became wetland-like, the vegetation crowding the trail and the smell of dampness permeating the air. Sure enough, it was close. This wouldn’t be any kind of rock hopping creek, this was a full on river ford…luckily at low flow. Of course Chris was loving the fishing and was disappointed that it wasn’t the place to camp for the night or he would have been catching enough fish to feed everywhere. We hung out here for about thirty minutes, snacking, refilling water and waiting for everyone to catch up. Finally the rest of the crew did catch up, and as Curt and Chris had been there for longer than everyone combined they headed on our first. There was another water crossing in less than a mile, to cross the river again back to the same side we’d been on, and we said we’d all meet there. This is where things changed course for the rest of the day. So, Curt, Chris and another guy, Leonard were on up ahead, and my dad and I were not too far behind them. The rest of the group, six other people, were still gathering water, putting shoes on and eating snacks. Dad and I walked the short path up to the main trail where we saw a blaze (white, all of the blazes were white except for one other trail which had yellow and white) going to the right. I’d recently looked at the map and it was clear that the trail went to the left while a side trail going south went to a trailhead. Dad and I hesitated for a few moments and decided we’d go left and see if we saw a blaze, and if not turn around. Of course we found a blaze and carried on along the lowlands next to the river. We quickly came upon other hikers and day use visitors taking advantage of the beautiful scenery of this particular area of the river. It was gorgeous! I only wished we’d been camping there that night! 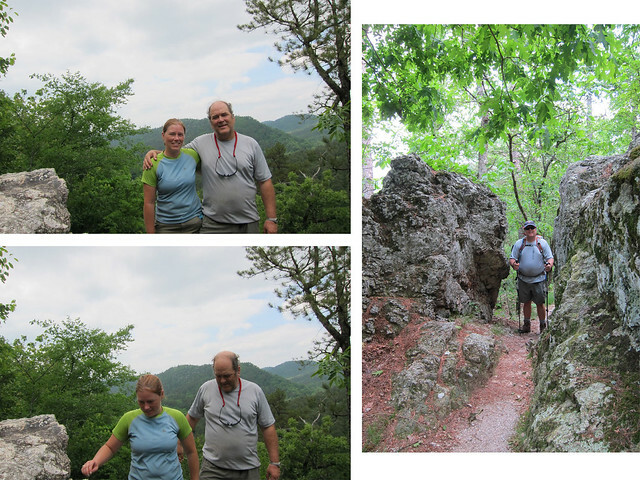 We rounded a few bends and walked a few rocky outcroppings and then found the other three who had been ahead of us. Chris was fishing (of course) and Curt and Leonard were taking in the scenery. It was pretty spectacular! Finally we decided to keep on going, expecting the rest of the crew to be not far behind us. We knew we had the next water crossing and that would take some time so off we went. At the second crossing, which was relatively short due to a gravel island in the middle that allowed us to get across the east side easily, we found two different couples intimidated by the fact they were going to have to take their shoes off to cross to our side of the river. It wasn’t that deep, knee deep at most. The five of us crossed easily and finally the two intimidated couples made it across. It was there we waited for a good thirty minutes or more for the rest of the group. We figured they would stop and take pictures at all of the scenery behind us, but we couldn’t imagine what was taking them so long. I read my book for awhile, perched on an uncomfortable log. Chris fished. Curt moped about. Leonard took a hiker bath in the river. We waited and waited. Curt and Chris finally decided to leave and continue hiking, saying they would meet us at the next stream crossing for lunch. Dad wandered off to use a tree and found a neat waterfall that he sent me to see and photograph. Finally we gave up and decided to keep on going, knowing we had miles to make and that the rest of the crew would catch up eventually. We hiked up the bluff, coming onto the ridge above the river. Dad would turn around every so often and look back, hoping to see the rest of the group. No one. Eventually the trail curved around a bend and the place where we had crossed fell out of view. The top of this mountain had either been clear cut recently, been burned or a storm had done some damage. Several trees were down across the trail and the tree cover was lacking, undergrowth dominating the scenery. Several groups of hikers passed us as we made our way northward in this section, one group being a motley group of what appeared to be Boy Scouts. They were glad to be near the top of the mountain while we were glad to be going down the mountain. Descending the mountain we waited to hear for streams, crossing one barely trickling stream where the three hikers ahead of us had not stopped at, finally we found the right one. 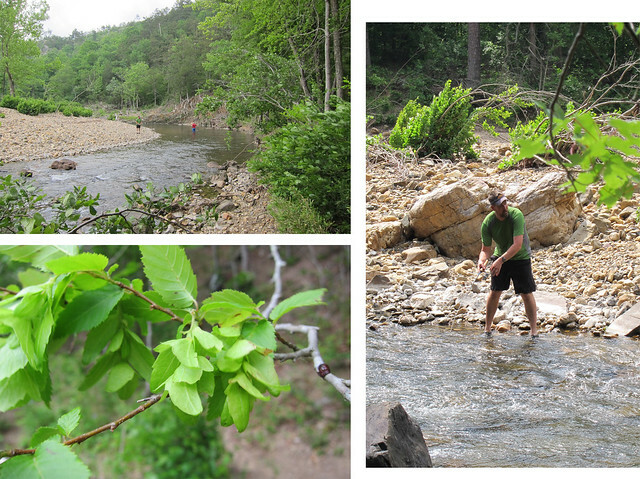 Chris was downstream fishing while Leonard and Curt was perched under trees eating lunch. This stream was more formidable than the other stream we’d rock hopped across earlier that morning—in fact it was the stream we’d forded the day before at lunch. Off our shoes went, despite a few nice rocks that looked potentially favorable for walking on, however none would complete the path across the stream. In the middle of the stream there was what appeared to be the remnant of an old bridge, washed away in a flood. Across the stream we found ourselves settling down for lunch. Chris and I had brought dehydrated beans to make burritos out of for lunch for the three days and since I had been carrying the fuel and stove he had been waiting for me to eat lunch. Lunch boiled up quickly and we devoured the food. Our lunch spot happened to be near the Winding Stair trailhead and we had several small groups of people come through while we ate. One family in particular held to my memory, it was a woman, a boy and a girl and the man was obviously military—well built, close shaved hair, tan army-looking boots. The kids carrying small school-packs and the adults regular packs, found the stream and realized it was going to be a bit tricky. The girl and woman decided to try to rock hop as best they could despite water rushing over most of the rocks and the little boy had a more difficult time deciding what to do. The military dad finally decided to just pick the kid up and carry him across, not caring one iota about getting feet wet. I could only imagine he’d been through worse terrain. It was interesting watching this family interaction, mostly because I was happy to see a family backpacking. The butterflies in the forest while we were hiking were amazing; they were abundant and beautiful. 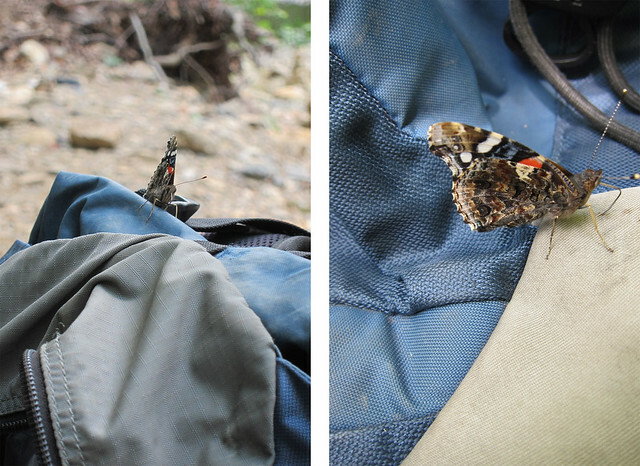 We had several landing on our packs either attracted to the color or the salts. Lunch was finished and of course Chris and Curt were ready to go. Shortly after Leonard left. 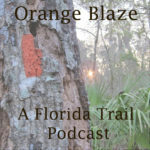 I’d gone up the trail a bit to use a tree and had seen some of the junctions of the side trails to the parking lot but there were a couple of weird paths crisscrossing this intersection, so I told them to make sure to hang a right and look for the blazes. Dad and I left not too long after Leonard. We had two more miles to go before getting to the Albert Pike Campground, site of a horrible flash flood two years ago. We planned to hang out there until the rest of the crew caught up to us. 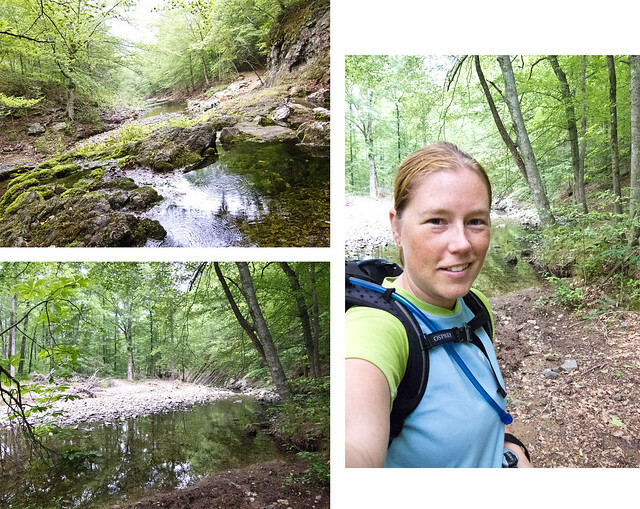 By this time the humidity was starting to soak in and we had a few small hills to climb. Not in any rush, we took our time, dad and I, stopping for breaths and enjoying the scenery. 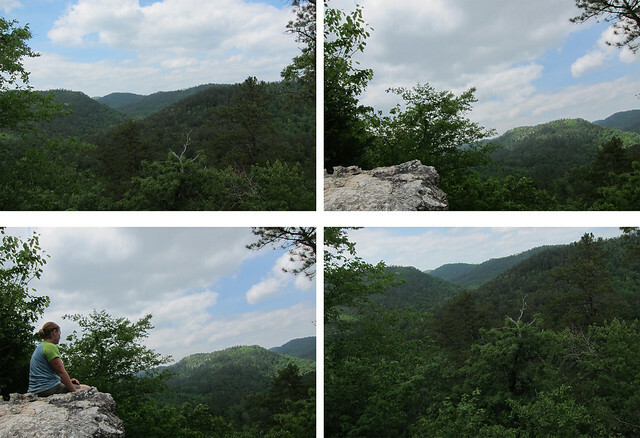 We reached this nice overlook, one of the few clearings on the trail, and stopped for a few minutes to enjoy it. Down below, voices and the sounds of life were beginning to come into earshot. Dad and I did the obligatory timer self-portrait! 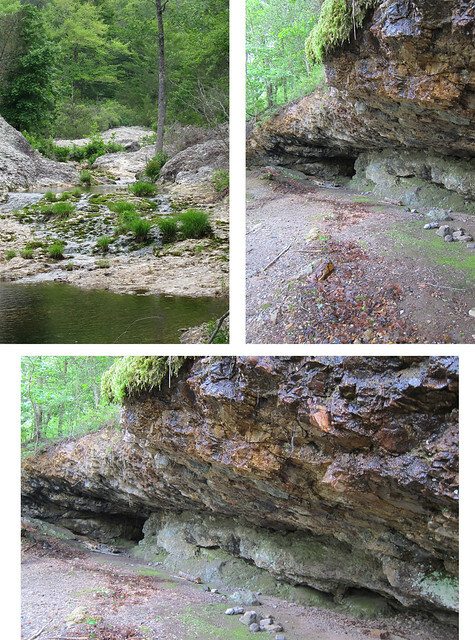 There were a lot of cool formations in this area; it made me happy to see them. We also stumbled upon a weird concrete building/platform that we couldn’t quite figure out what it was for. It almost looked like an old tower base but it was rather high. Eventually we started descending, the noise from below growing louder. Fences were put in place on the switchbacks in an attempt to prevent switchback cutters (don’t cut switchbacks!) but they weren’t very good at doing their job. As we came down into the Albert Pike campground we saw a couple of backpacks perched near the picnic tables and someone sitting there. For a second I thought it was Leonard but then realized it was Mike. You see, Mike was supposed to be with the other group! Quickly we asked where he had came from and where the rest of the group was, thinking they had all hitched a ride because earlier in the day Rebecca, Mike’s wife, had taken a stumble and hit her head—maybe she had a concussion. Well, when the trail petered out, Mike went one way and the others went another way and before he knew it there was no trail and he was a bit lost. So, figuring that he was still going the right direction he continued following the river until it just became apparent it was not the right way. Eventually he found houses that abutted the river and bushwhacked his way up to them, finding no one home. He continued a bit until he found a couple of guys moving some furniture and asked them for some water and about where he was. This next tidbit was good—because when we had last been together as a whole group at the first river crossing, I had mentioned that Albert Pike might be a good place for lunch. This bit of information had stuck with Mike and so when asked where he might need to go, he said Albert Pike. That’s when the furniture guys told him he was on the wrong side of the forest for that! Offering him a ride they first decided to take him to a bridge where the river crossed to see if the rest of the group might be waiting. Finding no one there the furniture guys said they would take him to Albert Pike and hope that the group in front was already there waiting. There could have been a chance we would have been gone, but at least he was willing to take the chance; it was a known place. The problem with all of this of course was there was no cell phone signal, so even if we’d tried to call each other it wouldn’t have worked. So, we’re talking to Mike, he’s showing us on the map where he wandered around in the forest at, we’re all worried because the other group has no idea that Mike is alright and who knows if they are still waiting and looking for him. It’s about 3pm at this point and we’d hoped to hike at least three more miles for the night. It didn’t look like that was going to happen. Meanwhile, Leonard isn’t there. Chris and Curtis are. Chris is fishing, Curt is wandering around. Oh, the other good thing is that a general store is about a quarter mile away down the road—excellent! They had already been there to get snacks and brought back IBC rootbeer and cream sodas. Everything about the little park area reminded me of thru-hiking, coming into some place to refuel and rest. It made me a little sad, wishing the hiking could go on. So, because Leonard isn’t there and because dad and I knew he was ahead of us, we start to worry he went off ahead of the group because they had all gone over to the general store. If no one was at the campground he could have assumed that they had continued on. Now we were concerned about two sets of people! I wandered up the trail a little bit to see if I might spot Leonard up ahead but didn’t. Instead I ran across this caterpillar crossing the road. I think it is some kind of swallowtail butterfly. I played with for a few minutes before releasing it and continuing on down the trail to scout for Leonard. About an hour later after watching the trail head for signs of activity and carefully eyeing every car that drove by to see if it was carrying a mess of stinky hikers, we finally saw someone come down the trail. It was Leonard! What on Earth!?! Well, apparently at the intersection of trails right near where we had had lunch he had gone right but too far right and took a turn down another trail. It was marked with yellow blazes and for awhile he thought nothing of it. However, it was going on too long and he hadn’t caught up to Curt and Chris (Leonard’s a fast fellow) and finally he got worried. He blew his whistle for a bit but no one responded. Finally he decided to turn around and of course came back to the intersection and found the right trail. I have to say, this forest needs to be better on their signage and blazing! They need to adopt the method of blue blazing side trails to trail heads and the such. Now at least we were back to only waiting for the group now and not having to worry about Leonard. 5pm rolled around and we were still sitting there. Dinner time and unsure of what was going on. Dad had decided to stick it out to 6pm or so, maybe even later if we could, just to see if the group arrived. We would have stayed there for the night if we could have but the campground was still closed from the flood two years prior. Chris was catching fish to cook over the grills at the picnic tables and I was making my own dinner as was many others when finally we heard chatter up the hill on the trail. Dad yelled up to the group that we had Mike and shortly after the group descended into view with Rebecca running towards Mike the moment she saw him. We weren’t sure if he was in for a slap on the face or a hug but as soon as I saw her face breaking out into tears I knew it was going to be a hug. Thankfully this all turned out good. It could have been one of those stories you see about hikers getting lost in the woods, but this one ended well. 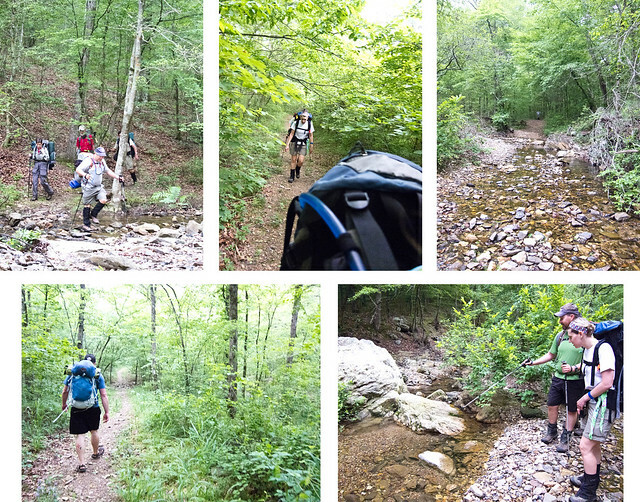 The stories were re-told, especially to find out about the rest of the group and how long they waited before finally giving up and hoping for the best and heading to the Albert Pike campground. Fish was cooked, dinner was eaten and a last minute trip to the general store was had for a bathroom break. No, using a flushing toilet never gets old when you’ve been digging holes for a bathroom. 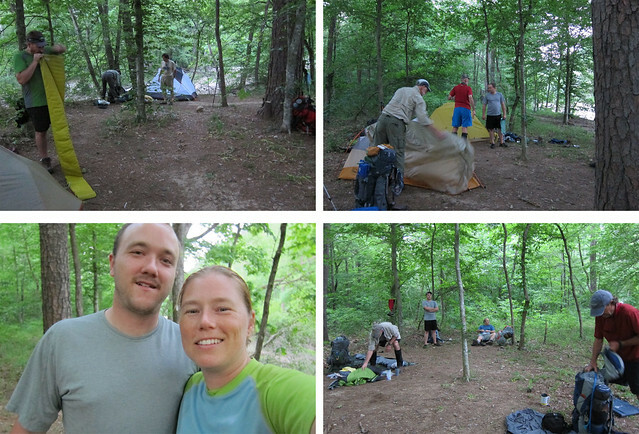 We had about an hour to get far enough down the trail and find a good campsite for us all to stay at for the night. It was a beautiful walk along the river this direction as the sun was going down. About a mile later we crossed a small channel leading into the main river and on the other side we found our campsite for the night, sheltered in among the trees. We tried to stay up for awhile, head lamps on, chatting in the dark. I was itching to read my book so I retreated to the tent to read and listen to the conversations outside. Finally it was time to relax, sleep and put the stressful day behind us. huge “sigh”! I want to go there. But I don’t want to back pack. I want to just camp and do day hikes. It looks so nice.